The monkey on slide 6 of the lecture 22 slides is (I believe) a Golden Palace monkey. I had the pleasure of meeting a group of these monkeys in Parque Nacional Madidi in Bolivia in February of 2009. They are very cool. They were surprisingly not that hard to find for us, our guide said we were very lucky. A group of wildlife enthusiasts had come several months before in search of the monkeys and stayed for a week, never spotting one. The discovery of the golden palace monkey was certainly exceptional, but it goes to show how remote parts of the world really haven't been extensively combed for animal species, even large ones like these. 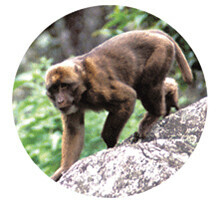 A group of scientists discovered the monkey in 2004. Instead of naming it, they decided to auction off the naming rights to raise funds for FUNDESNAP, the non-profit that maintains the national park where the monkeys live. Goldenpalace.com, an online casino known for outlandish publicity stunts, bought the naming rights for $650,000.